Elegant four claw round solitaire with princess cut diamonds channel set into the band. 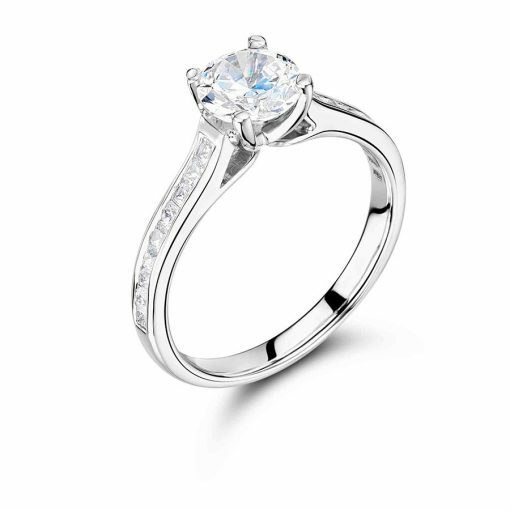 A modern take on a classic engagement ring. The channel set shoulders have no claws holding the diamonds in place, just the tension of the metal. This gives a very clean and chic finish. This is a wedfit style, meaning that a straight wedding ring will sit flush against this ring. Voltaire Diamonds can custom make this ring for you starting from approximately €1,500 and will advise you on the quality of stones available. We will source the perfect diamond for you. This ring can be set in 18k yellow, rose, and white gold, and platinum. We would be delighted to meet with you at our offices just off Grafton Street and discuss your options.